You know it’s time to be more proactive about your oral health, but you’re wondering if that means you need to visit your local dentist. Can’t you just brush and floss your teeth a little more frequently? Isn’t that enough? Your experienced dental care professional says it’s imperative that you visit not just for your oral health, but to help identify other health issues that may be lurking. Learn more about how valuable preventive care visits are as you read on. Preventive care involves visiting your dentist semi-annually before a problem strikes to lessen the chances of major issues arising. It also provides an opportunity to catch problems in the early stages so that the least invasive treatment protocols can be used to correct them. What Happens at a Typical Visit? Cleaning – The thorough cleaning you receive will remove any lingering plaque and tartar that are on your teeth and at the gum line. 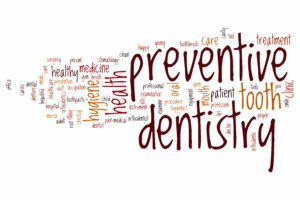 This is key for preventing any serious problems like gum disease and oral cancer. Examination – The examination allows your dentist to look for any issues that may be quietly developing so that he can address them quickly. While it is geared mainly toward protecting and improving your dental health, there is another great benefit to receiving an oral examination. Both medical and dental professionals have come together to adopt a new term and way of looking at total health, called oral systematic connection. This speaks to an understanding that what happens in your mouth is not isolated from the rest of your body. Thus, when you go in for a semi-annual visit with your dentist, you are not just getting an oral cleaning and screening. You’ll be able to get some valuable information about your overall wellness that you can pass on to your physician. This is because your mouth serves as a window into the health of the rest of your body. There has been a connection found between gum disease and diabetes, where people who suffer from the former are usually more susceptible to the latter. Gum disease has also been found to factor into problems with expectant mothers carrying babies to full term and can increase the instances of low birthweight. Finally, there’s a well-documented relationship between gum disease and cardiovascular problems, where the bacteria on your teeth and under your gum line travels down to your arteries, possibly causing life-threatening complications. Given that gum disease is the common denominator in all of the above scenarios and begins with excess bacteria growth, the cleaning that you’ll get at your dentist’s office also plays a significant role in enhancing your overall health. So to be as proactive as you can in maintaining your total wellness, reach out to your dentist to schedule an appointment today! A graduate of the UCLA School of Dentistry, Dr. Nelson Y. Howard has over 30 years of experience practicing dentistry. A highly accomplished professional, he has written several peer-reviewed papers and received rewards for excellence in his proficiency and skills. You can find out more about how he helps improve his patients’ health through his website.